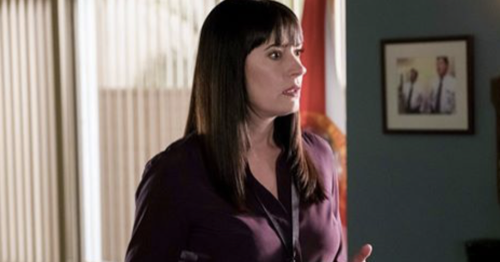 Three young women have gone missing in the last five years in a small town in Virginia and neither the BAU nor the FBI had been alerted until a fourth woman was taken on tonight’s all-new episode of “Criminal Minds”. However, the team was used to facing some resistance from local law enforcement because often not everyone was willing to believe they need help. Sometimes no one wants there to be a problem and so they dismiss the disappearances as people getting fed up with their jobs or wanting to start over though this time around they had been forced by a concerned community to take notice. The media got a hold of the disappearances and everyone with a missing family member came by wanting details about the case. Like Joanna Miller. Joanna had found out about the missing women with the help of the media and she had wanted to know if it could be connected to her own sister’s disappearance. Her sister Chrissy went missing not far from Allie Leighton and so she had just wanted the police to take her sister’s case seriously. Though Captain Skinner had fobbed her off. He had told the BAU when the team arrived that the cases couldn’t be connected. He said Chrissy was a troubled teenager and that she most likely ran away, but a case about a missing sister had gotten to JJ. JJ knew what it was like to live with that loss and so she still wanted to speak to Joanna despite what the good old captain thought. But Joanna hadn’t been the overwrought sister trying to grasp at strings. She had been clear and she had been precise. Joanna said her sister got into trouble after their parents broke up and that Chrissy had been intent on changing her life around in the weeks leading to her disappearance. So what Joanna said had pushed JJ to investigate matters and what she found had been compelling. Chrissy had gone missing the same time another teenager had been reported missing. Yet, what the two had in common was that both had been pregnant when they had gotten kidnapped and so it had started making sense why Dr. Roberta Child who was an obstetrician had gotten kidnapped mere days after the others. The Unsub was taking these pregnant teens for some reason and the babies had needed someone to take care of them. So that’s why a lot of professional weapons have been taken over the course of the last five years. A doctor, a teacher, a dentist, and lastly a chef. However, Roberta must have wanted out one way or another because her body was eventually found by the side of the road. She had slit her wrists and someone had tried to preserve her life, but she had had old scars that showed she had been trying to kill herself for years if not from the very start. So her death pushed the Unsubs into reacting and the team later received footage from when another woman had gotten kidnapped. She too was her doctor and she had been taken to act a replacement for Roberta. Unlike the others, though, Dr. Paige Burell had been taken during the day. She had been taken by a male unsub while out shopping for groceries and the team noticed the Unsub had hesitated when he kidnapped her because he had been looking at the clock. But they remembered that the other woman had been taken close to midnight and so that helped one of them to put it together. The Unsubs believed in Doomsday. Doomsday was supposed to be end of times and there was even a Doomsday Clock that was created by scientists to the state where mankind fell on a regular day. And so that put everything into place. The Unsubs have been following the Doomsday clock. There must have been an incident five years ago that triggered their paranoia about when the end was happening yet they started to prepare and they took all they needed to restart civilization. They had kidnapped the pregnant girls, doctors, teachers, chefs, and everything that would keep one man happy. Though the team had quickly identified Lawrence Coleman. He was analytical and had an internet history proving how obsessed he was about the end of the world. So he had roped in Irene Jacobs. Irene was just as obsessed and unfortunately her job as a drugs counselor had put her in touch with girls that merely wanted help. Yet, Irene helped Lawrence to kidnap whoever they needed to feed their obsession and she didn’t realize that she was duped until both Allie and Paige tried to escape. The two women had stolen a knife from the kitchen and they had taken her hostage in the hope that Lawrence would let them go. So it had come as a surprise for all of them when Lawrence told the ladies they could do what they liked with Irene. He hadn’t cared about her. He had cared about being right and had even stayed around to trap both Reid and JJ who found their bunker first because he wanted to show off to the younger girls. Lawrence had wanted to tell them how Reid and JJ were liars that wanted them to go above ground where there was nothing left because they were jealous. But his arrogance was what cost him. Lawrence thought the girls would always believe him and what he said. So he didn’t think the girls would believe the agents, but JJ showed Chrissy a picture Joanna had given her and so that made Chrissy’s son Jo wondered what was below ground as well as why he had stayed there. So that pushed Chrissy into questioning Lawrence’s logic and she attacked him before he could do anything else to her or her son. But while the Reid and JJ were able to later arrest both Lawrence and Irene, deprogramming all of their victims was going to be a battle and they were going to need all the support they could get in the years to come.